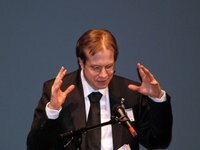 Dr. Björn Quiring studied comparative literature and philosophy in Berlin, Paris and New York. He wrote his Ph. D. on the aporias of ritual cursing in Shakespeare’s histories and teaches literature at Viadrina University in Frankfurt/Oder. He is interested in literature as the persistent border conflict between the domain of textual signs and the areas that seem to remain beyond the grip of language, e. g. mere sound or the materiality of tangible objects. Quiring has published an article on the theologico-juridical uses of sound in Shakespeare’s „King Lear“ („Mark the high noises“ – „King Lear“ und der natürliche Grund des Donners, in: Shakespeare Jahrbuch 143, 2008, Bochum: Kamp) and diverse texts on noise and experimental music.